Screening for antifungal activity of garlic powder against mycelia growth of three post-harvest pathogens (Aspergillus, Rhizopus and Mucor species) was investigated in this study. Five grams of malt extract agar (MEA) were poured into a conical flask, 100 ml of water and different weight of garlic powder (1, 3, 5 and 7 g) were separately added, stirred and later sterilized while MEA medium with no garlic added (0 g) served as control. The mycelia of each post-harvest pathogen was cut with 6mm cork borer and placed on the solidified medium in the Petri dish and incubated at 28±2oC for 72 hours. Phytochemical screening of the garlic powder was also investigated. 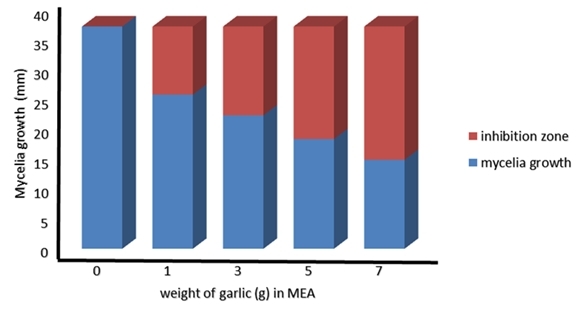 Results from this study showed that the different weights of the garlic powder apart from the control (0 g garlic) significantly inhibited the mycelia growth of the three post-harvest pathogens tested in the study and the order of antifungal activity of the garlic powder against mycelia growth of Aspergillus, Rhizopus and Mucor species was 7 g > 5 g > 3 g > 1 g > 0 g, 5 g > 7 g >1 g > 3 g > 0 g and 7 g > 5 g > 3 g > 1 g > 0 g respectively. The antifungal activity of the garlic powder may be related to the presence of active antimicrobial agents including alkaloids, saponins, tannins, flavonoids and cardiac glycosides that were detected in the powder. 1. Calvo J, Calvente V, De Orellano ME, Benuzzi D, Sanz de Tosetti MI. Biological control of postharvest spoilage caused by Penicillium expansum and Botrytis cinerea in apple by using the bacterium Rahnella aquatilis. Int J Food Microbiol. 2007; 113: 251-257. 2. Mogala M. A profile of the South African apple market value chain. Department of Agriculture, Forestry and Fisheries, Arcadia, Pretoria, South Africa, 2012. Online: www.daff.gov.za (Retrieved 20.09.2013). 3. Wazir AM, Ghulman SM, Abul-soad AA, Abdulmubeen L, MushtaqueAJ. Chemical control of sudden decline disease of date palm (Phoenix dactylifera L.) in Sindh, Pakistan. Pakistan J Bot. 2013; 45: 7-11. 4. UNEP. Montreat Protocol on substance that depletes the ozone layer. Methyl Bromide Technical Option Committee Kenya, 1995: 304. 5. Tian SP, Bertolini P. Effects of low temperature on mycelia growth and spore germination of Botrytis allii in culture and on its pathogenicity to stored garlic bulbs. Plant Pathol. 1995; 44: 1008-1015. 6. Ankri S, Mirelman D. Antimicrobial properties of allicin from garlic. Microbes Infect. 1999; 1(2): 125-129. 7. Alexopoulous CJ, Mims CW, Blackwell M. Introductory mycology. John Wiley and Sons Inc., New York, 1996: 86-120. 8. Habourne JB. Method of extraction and isolation in phytochemical methods. Chapman and Hall, London, 1998: 60-66. 9. Trease E, Evans WC. Pharmacognosy. 15th edn. Saunder Publisher, London, 2004: 137-140. 10. Abdulaziz BK, Musa DD, Aisha H. Antifungal activity of garlic (Allium sativum) extract on some selected fungi. J Med Herbs Ethnomed. 2018; 4: 12-14. 11. Russel PE, Mussa AE. The use of garlic (Allium sativum) extracts to control foot rot of Phaseolus vulgaris caused by Fusarium solani f.sp. phaseoli. Ann Appl Biol. 1977; 86: 369-372. 12. Obagwu J, Korsten L. Control of citrus green and blue moulds with garlic extracts. Euro J Plant Pathol. 2003; 109: 221-225. 13. Rojas A, Hernandez L, Pereda-Miranda R, Mata R. Screening for	antimicrobials activity of crude drug extracts and pure natural products from Mexican medicinal plants. J Ethnopharmacol. 1992; 35: 275-283. 14. Al-Fatimi M, Wurster M, Schroder G, Lindequist U. Antioxidant, antimicrobial and cytotoxic activities of selected medicinal plants from Yemen. Ethnopharmacol. 2007; 111: 657-666. 15. Atia MM. Efficiency of physical treatment and essential oil in controlling fungi associated with some stored date palm fruits. Austral J Basic Appl	Sci. 2011; 5: 1572-1576. 16. Marjorie MC. Plant products as antimicrobial agents. Clinical Microbiol Rev. 1999; 12: 564-582. 17. Carson CF, Mee BJ, Riley TV. Mechanism of action of Melaleuca alternifolia (tea tree) oil on Staphylococcus aureus determined by time-kill, lysis, leakage and salt tolerance assays and electron microscopy. Antimicrob Agents Chemother. 2002; 46: 1914-1920. 18. Harris JC, Cottrell S, Lloyd D. Antimicrobial properties of Allium sativum (garlic). Appl Microbiol Biotechnol. 2001; 57: 282-286.